I have been patients of Dr. Ali and Dr. Melika for almost 10 years now. They have such a warm andwelcoming practice! Their staff, especially Heidi, is so helpful and accommodating. You really feel like your family there. Highly recommend! I have been patients of Dr. Ali and Dr. Melika for almost 10 years now. They have such a warm and welcoming practice! Their staff, especially Heidi, is so helpful andaccommodating. You really feel like your family there. Highly recommend! Very nice facility. Dr.Shatergholi was nice thorough and listened to all of my concerns. Great doctor, will definitelybe going back! Very nice facility. Dr.Shatergholi was nice thorough and listened to all of my concerns. Great doctor, will definitely be going back! Dr. Shatergholi has been in the field of dentistry since 2003. He sincerely enjoys coming to work every day and interacting with his patients. He considers the relationship he has built with his patients over the years as something comparable to an extended family. Dr. Shatergholi’s primary goal is to provide the highest quality of care and give his patients a cosmetic smile they can be proud of for many years to come. Dr. Shatergholi graduated from the University of Maryland with a Doctor of Dental Surgery (DDS) degree. Prior to that, he graduated from the University of Baltimore with a Dental Hygiene degree. 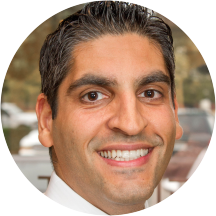 In his spare time, Dr. Shatergholi enjoys, hiking, skiing, playing basketball, and volleyball. From the moment I walked into the office I felt welcomed. The staff was friendly and pleasant. The Doctor took time to explain every thing to me and made sure that I understood. The overall atmosphere in that office is pleasant. Really great place and great staff. Dentist was knowledgeable and explained everything to me. Definitely recommend! Awesome experience. Would definitely recommend and return. It has taken me 2 years since moving from Virginia to Maryland to switch dentists. Dr. Shatergholi was a great choice! He is professional and personable. He is very interested in his patient's comfort. He did the cleaning himself and inspectedmy teeth carefully. He answered all questions thoughtfully and thoroughly. I would recommend this practice. Great visit, very happy with the service, treatment and approach. Zero wait time. Everyone was very friendly, I only waited in the lobby (which smelled wonderful, not at all like a dentist office) for about 5 mins after finishing my paperwork. Dr. Shatergholi was very nice, and patient. She made sure to go overmy xrays with me and explain everything that was going on. I definitely plan on returning. I was extremely pleased. The office is beautiful. The hygienist are very kind and respectful. The front desk people are quick and attentive. I highly recommend this dentist. The facility is lovely and everyone is very friendly. Dr. Shatergholi was efficient, informative, and warm. I highly recommend her! Very professional, easy to talk to, and he did a good job. I will be going back! Wait time was good (but I it was also a morning appointment). However,I was not overall impressed. Dr. Shatergholi was not very personable nor did he seem interested in establishing a doctor-patient relationship. I will be taking my son to Dr. Shatergholi's from now on. They were very sweet to him and helpful in finding problems to the issues he has been having. very friendly and professional staff. Got in quick and the Dr. was friendly and professional. I understood every procedure he was doing or would like to do to work on the problems of my teeth and I understood the charges. Thank you. I will be making educated decisions on how to take care of my teeth. I've always been scared of going to the dentist but I got out with a smile on my face today ! The entire team made me feel comfortable, and did everything to help me relax ! No pain at all, everythingwent very well. I will continue to see Dr. Shatergholi and recommend him to friends and family. Very kind and nicely explain. Following a friendly reception, a full set of X-rays was taken by the dental assistant, who was very personable and efficient. After that Dr. Melika Shatergoli took me threw the findings on the X-rays and was very patient in explaining whatlooked to be an issue and why. She then thoroughly examined me, both following up on what was evident in the x-rays as well as visually inspecting all teeth. She then drew up a treatment plan, which she explained at great length, and making recommendations about what needed to be done, keeping in mind that the insurance coverage will run out before the end of the treatment. I am very impressed with the professionalism and attention to detail, combined with her treating me not as a medical condition but as an as person -- and an adult at that. I will be returning. I loved it!!! He is very nice and knowledgable and doesn't have you in the chair all day! His whole staff is very very nice! They even let me watch Netflix while waiting!!! I love this place! A welcoming and cozy waiting area with a very pleasant and helpful staff. Dr. Shatergholi actually ended my search today for an informative dentist that I can trust to provide me with the care I need. Wonderful Experience!